Joy started her weight loss journey on 17th June 2002 when she joined Echuca TOWN Club. Committed to losing weight, Joy attended meetings applying what she learnt from Group Therapy to improving her lifestyle. Joy has experienced the same struggles as most members; however this did not stop her from attending meetings or making excuses. Joy lost a total of 24.7kgs and has continually held graduate status since 2005. 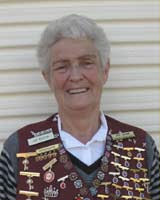 Joy has always been a willing volunteer serving in a number of positions at Echuca TOWN Club. Such inspiration and dedication is often a hard combination to find; however, despite Joy's success she remains a humble valued member who always tries to encourage other members to strive to be the best they can. Echuca TOWN Club is extremely proud of Joy.